Nelson Mandela had a soft spot for London singer Amy Winehouse after a quip she made about his time in prison - former prime minister Gordon Brown has revealed. The ex-Labour leader said the pair met at former South African president Mr Mandela's 90th birthday party, at which singer Winehouse made a joke comparing the anti-apartheid campaigner to her husband, Blake Fielder-Civil. In an interview with the Guardian's G2 magazine, Mr Brown said: "The person he (Mr Mandela) most liked was Amy Winehouse. "She said to him: 'You and my husband have a lot in common'. "He said, 'Oh, what is that?' "She said, 'You've both spent a long time in prison'." 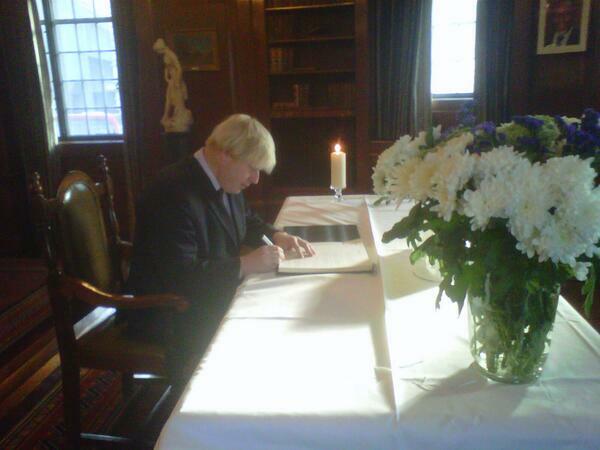 The life of Nelson Mandela will be celebrated at Westminster Hall later this afternoon. A number of musical performances are expected to take place. Foreign Secretary William Hague and Labour leader Ed Miliband are among the political figures who will pay their tributes. The Archbishop of Canterbury has spoken at a special service at St Martin-in-the-Fields in Trafalgar Square, remembering Nelson Mandela. There is a growing celebratory atmosphere at South Africa House in Trafalgar Square today. A strong smell of incense fills the air as crowds remember Mr Mandela with a constant flow of song and dance. The shrine and the group are the focus of photographers, broadcasters, reporters, intrigued passers-by, and passengers on the top deck of passing buses. Mr Mandela's key moments in London include Baroness Lawrence crediting him with helping their efforts to get justice for Stephen. Images of Nelson Mandela's many visits to the capital. The Queen visited a plaque commemorating Nelson Mandela's 1996 visit to Parliament after saying she was "deeply saddened" to learn of his death. She was heard telling Commons Speaker John Bercow how 'William and Catherine' heard the news at the premiere of the film about the former South African President's life; Mandela: Long Walk To Freedom.